All of you have been invited to our FREE Wine tasting session at our USJ Branch. We will be tasting wines from Trivento, Argentina! American Ginseng helps to increase physical and mental endurance. It also helps to reduce tiredness and enhance memory. 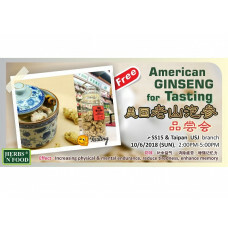 Come and join us this Sunday for our American Ginseng tasting event at SS15 and USJ store! All of you have been invited to our FREE Wine tasting session at our USJ Branch. We will be tasting wines from France! Herbal Detoxifying Tea is good to relieve body heat and reduce throat inflammation, it also helps to detox and enhance general immune system. 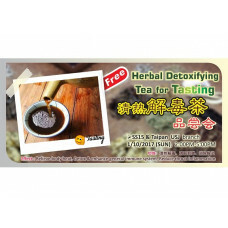 Come and join us this Sunday for our Herbal Detoxifying Tea tasting event at SS15 and USJ store! Cordyceps Flower helps to nourish the lung, relief cough and reduce phlegm. It is also good for replenishing our blood (qi). 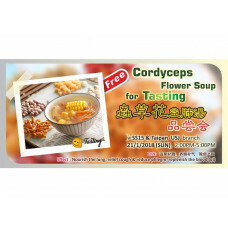 Come and join us this Sunday for our Cordyceps Flower Soup tasting event at SS15 and USJ store! This special wine tasting will be hosted by GM of De Bortoli, Darren Blood. Do not miss the opportunity to taste the premium wines from De Bortoli and also to learn more about Yarra Valley. Please remember to come early as there are limited sample available. 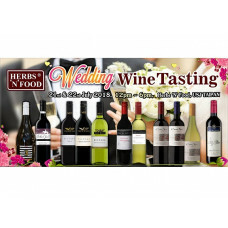 All of you have been invited to our FREE Wine tasting session at our USJ Branch. We will be tasting wines from Chile, New Zealand, France & South Africa! All of you have been invited to our FREE Beer tasting session at our USJ Branch. We will be tasting craft beers from Hong Kong! - The tasting is FREE and there will be Roast Pork and Finger Food too! - Spread the word to friends and family! All are welcome! - Finger food will be served throughout the tasting session. - Times and venues are subject to changes, email's will be sent out if there are any. NOTE: WILL LIKE TO APOLOGIZE TO MY MUSLIMS FRIENDS IF I ACCIDENTALLY INVITED YOU ALL FOR THIS EVENT. SORRY! We will be tasting wine from Morande, Chile!